Volkswagon is launching what it calls the most fuel-efficient production car in the world. The VW XL1 is a hyper efficient, highly aerodynamic, two-seater car that gets an astonishing 261 miles/gallon fuel efficiency as measured by European standards. The VW XL1 is the embodiment of the hypercar concept developed by Amory Lovins years ago. That concept was to develop an extremely lightweight car, with extreme aerodynamics, to waste the minimum of fuel on weight and wind resistance. VW describes the XL1 as following race car principles, meaning ultra light weight (1753 pounds), great aerodynamics (Cd 0.19), and a low center of gravity. The result is the ability to cruising at a constant 62 mph uses just 8.3 horsepower. In all-electric mode, the XL1 requires less than 0.1 kWh to cover more than a kilometer. Further, the XL1 is rated for 21 g/km of CO2 emissions thanks to its high efficiency. The plug-in hybrid drive train adds more efficiency to the mix. The electric side of the car has an electric-only range of 32 miles, a 27-hp electric motor, a seven-speed DSG® dual-clutch automatic transmission, and a lithium-ion battery. The petrol-driven side of the XL1 has a 47-hp two-cylinder TDI engine, making it a diesel-electric plug-in hybrid. TDI engines are widely regarded for high fuel efficiency and low emissions output. However, 0 to 62 mph time is a modest 12.7 seconds. The 261 miles/gallon figure is based on the European method of measurement and it's likely the EPA certified fuel efficiency figure would be lower. In any case it is far above the fuel efficiency of any other production car. Among those rated by the EPA the highest is the 2013 Scion iQ EV, an all electric subcompact similar to the Smart ForTwo. The iQ EV is rated for 121 MPGe combined highway and city, or 138 MPGe city, and 105 MPGe highway. 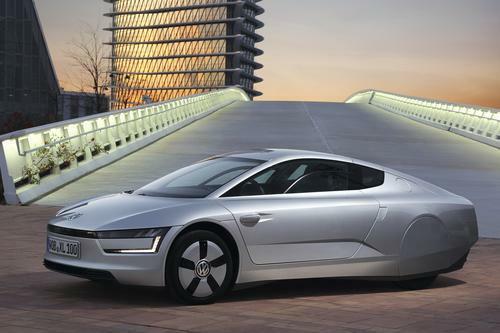 The VW XL1 is the result of two previous generations of Volkswagon's 1-liter car concept. That concept is production of a practical car that had combined fuel consumption of one liter per 100 km (235 mpg). Unlike a previous generation concept vehicle, the L1 which had the occupants sitting in tandem (one behind the other), the XL1 has them sitting side by side though slightly offset. The XL1 is 153.1 inches long, 65.6 in wide, and just 45.4 in tall. By comparison, a Volkswagen Polo is slightly longer (156.3 in) and wider (66.2 in), but is significantly taller (57.6 in). Even a purebred sports car like today’s Porsche Boxster is 5.1 inches taller.